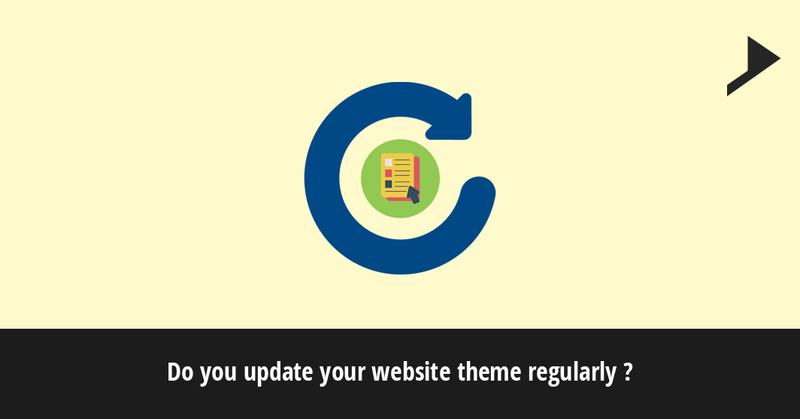 Do you update your website theme regularly ? Home / Client communication / Do you update your website theme regularly ? I am sure, you all are aware of the fact that if your website is built on WordPress platform it will be automatically updated by WordPress but have you ever thought about the website theme ? Are they getting updated accordingly. One of our client hired Sweans to make some edits to his existing website. One of the change that he wanted to make was to change the font used in the menu items in his navigation bar. He explained that his theme allowed Google fonts, but the font which he needed did not appear in the theme options. I then went on to educate him that not only does he needs to be on the lookout for updates to WordPress, his theme has updates as well. When WordPress updates, you will more often that not, begin to see notifications that your theme and/or plugins need to be updated also. He had not received any notifications that the theme had been updated. When I looked at the change log of his theme, i saw it had been updated 7 times since the website was built. What often happens when someone has their website built for them, the Designer, infusing a theme, uploads the theme using a Developer’s license, meaning that once the Web Designer purchases a theme license, he or she has purchased the rights to use that theme on as many websites and they choose. In doing so, the owner of the website (you) will not receive notifications of the theme updates. This also means the website owner does not have access to the updated theme files. Depending on the theme, it maybe necessary to remove and replace these files, but if you don’t have the files, you can’t update it. This was the situation in which my client found himself. How was he going to update his website? Luckily, his theme was still in existence and was able to purchase the theme himself so that he could have access to the files and I could update his website. As a business owner, would you like to leave your website security on the table? It is imperative that you have the latest version of WordPress, your theme, and any plugins you are using , not doing so leaves your website vulnerable to security issues. The above story is one of the many I hear from entrepreneurs who aren’t aware. This is why when I build websites for my clients, I make them purchase a theme license on their name. Why? Because I don’t want my clients to feel as if they are dependent on me. I like to go on vacation with my family, I may be asleep when my client decides, he wants to update his website at 2:00am. Now if he so chooses to wait for me to do make updates, that is one thing, that’s what my maintenance packages are for, but…it’s their choice. Not mine. I like to have options and so do my clients. Giving them the freedom to update their website if they so choose is a choice they should be able to make. I shouldn’t make it for them by holding their website hostage. May I know when was the last time you updated your theme? Leave your comments and i will be here to help you out with any of the doubts.